Taco Cleanse cookbook review Vegans Eat What? Help support VegansEatWhat.com by buying this book via our Amazon link! Do you tire of reading and hearing about cleanses? Do they seem humorless and less than tasty? If so, this book is for you! This book is a fun creation by four “taco scientists” from Austin, Texas. If you know Austin, then you know to be ready for a good time. The “scientists” are garbed in white lab coats complete with lab goggles. They write “tongue in cheek” about the scientific benefits of doing a taco cleanse, specifying the importance of “folding only once”. After all, you don’t want your creation to be confused with – gasp – a burrito! It’s easy to imagine this group of friends discussing the ideas in this book as they imbibe some of the “supplements” that they insist are an important part of any taco cleanse. And it’s a sure bet they were imbibing when they developed the “quotes” from various philosophers and artists that are sprinkled throughout the book. This book is full of tacos for every part of the meal, including desserts. It also provides for side dishes to serve with your tacos. Want to make your own tacos (which everyone should try at least once!)? This book will teach you how. The recipes are full of creative fillings that are clearly great in tacos. We also tried some of them served on top of grains such as quinoa or brown basmati rice (don’t tell!) rather than a tortilla. 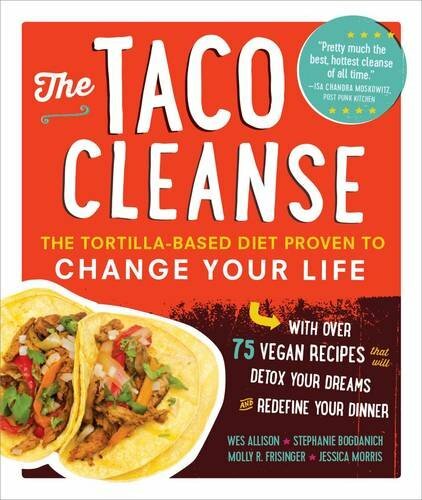 This book instructs the reader on the whys and the hows of doing a taco cleanse, claiming that a month of eating tacos (with supplements as appropriate) will cause your life to ignite with PASSION. Whether or not that is true, you will definitely have a month of yummy food. For the totally uninitiated, there is even an explanation of what a taco is! (Hard to imagine anyone needing that, but then I grew up 3 hours north of Austin.) At the end of the book, you will even receive instructions on how to live a taco-based life, including taco yoga, mudras, salutations, puzzles, gardens and more! We are still trying recipes from this fun book. Some include ingredients that you might expect for taco fillings, and yet there are creative surprises included as well (as you will see below). We’ve tried Beer Battered Portobellos, Therapeutic Tempeh Picadillo, Tropical Breakfast Tacos, Gallo Pinto (a Costa Rican national dish), Grounding Sweet Potato Fries and Jackfruit Brisket. 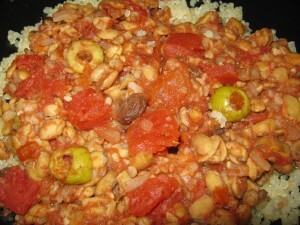 Below we share Therapeutic Tempeh Picadillo with you for your taco eating pleasure. Be sure to read the “tip” at the end! In a small bowl, dissolve the bouillon cube in the hot water and set aside. In a large skillet, heat the oil over medium heat. Add the onion and sauté for 5 minutes, or until translucent. Crumble the tempeh by hand into the skillet and cook for 5 minutes, stirring occasionally. Add the garlic and stir. Then add the oregano, cumin, pepper, and salt. Allow the spices to toast in the skillet for 30 seconds. Add the previously prepared bouillon and the tomatoes and red wine to the skillet. Deglaze the skillet by scraping the bottom with a spatula. Bring the mixture to a steady simmer. Fold in the raisins, olives, and brine. Reduce the heat and simmer uncovered for 20 minutes. The recipe fills 8 taco shells. Tip: This recipe calls for 1/3 cup of red wind, leaving the remainder of the bottle to drink while you finish cooking!